Background: The occurrence of Parkinson’s Disease (PD) is associated with the deposition of proteinaceous aggregates formed by the self-assembly of α-synuclein protein. The pathogenesis of PD has been reported to be linked with the α-synuclein gene. However, the presence of missense mutations: A30P, A53T, E46K, H50Q, G51D and A53E has also been linked with the autosomal inheritance of PD. 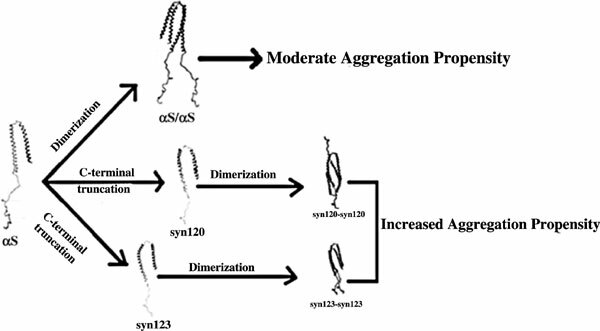 Recently, it has been highlighted that C-terminal truncated α-synucleins undergo aggregation at a faster rate while the full-length α-synucleins are critical. Objective: To study the dimerization of C-terminal truncations of α-synuclein and its effect on the aggregation propensity. Methodology: We investigated the dimerization of the two important C-terminal truncations (120 and 123) of α-synuclein using Molecular Dynamics Simulation and Potential of Mean Force (PMF) study. Results: From our PMF study, we observed that the binding free energy value to be larger for the association of C-terminal truncated α-synucleins than the value that has been reported for Wild-Type (WT) in our earlier study. Conclusion: Truncating the C-terminal region (which is considered to be intra-molecular chaperone) in α-synucleins exposes the hydrophobic region and thereby increases the aggregation propensity. Disordered, parkinson's disease, truncation, molecular dynamics, potential of mean force, α- synuclein.